The Sony CX405 Handycam is a medium priced hand held mini pocket digital video camera (hence the Handycam) which is small in size and light in weight. 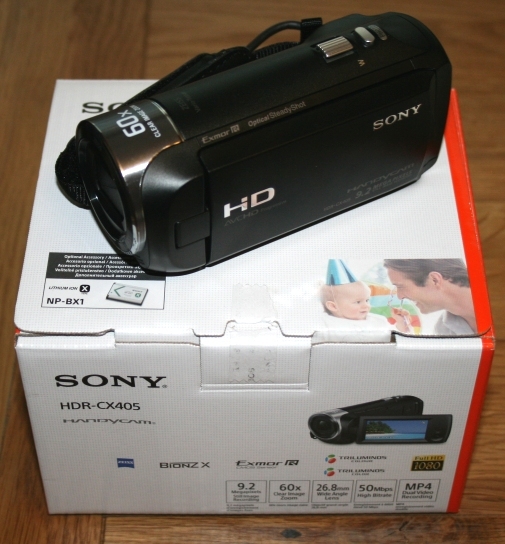 There are people who have done a small review of the CX405 camcorder on sites where they made their purchase, but I found these to be quite lacking in detail and thought the handycam deserved better. In some cases the reviews were nothing short of awful, inaccurate and offensive and it makes me wonder who these people actually are – maybe they are competitors trying to put a product down in favour of their own. I read one person who was actually complaining because THEY bought the wrong memory card – of course this has no bearing on the camera itself whatsoever. Anyway……. Firstly this video camera is not valued in the £500+ range, it comes in at around £150, so whilst it isn’t a cheap camera, it isn’t a top of the range device either, and this is reflected by its features which do not include things like Wifi connectivity, something the more expensive pocket cameras often have present. When I first picked the CX405 Handycam up, I noted it felt light in weight, moderately robust and it fit into my hand perfectly. The battery came separately and when I inserted it into the compartment, a little extra weight was added to the cam which, in my view, was just sufficient to add that extra feel of quality to the device. Some complainers have whined that it’s too light – however these types have never probably never had to hold a heavier camera in a fixed position for 30 minutes – enough said. The battery, as noted, is not installed in the camera when it arrives, the small Lithium Ion battery NP-BX1 is replaceable – and this is essential because they do not hold much charge after a number of deplete/recharges – cameras with built in non-accessible batteries are throwaway once the battery fails – the Sony CX405 does not suffer this issue. The front of the camera has a small switch which operates the lens cover (not motorized), this is fine, because some cams have a removable cover which is then dangling around all over the show or if not attached, gets lost! When you power up the camera, it warns you if the lens cover is closed – handy – yes we’ve all done it!! The videos produced using these settings showed up in Windows as having the following properties. You will notice that the fps is actually showing 25, and the pixel resolution on the video is 1280×720. I tried to set the handycam to record in XAVC S file format, hoping that perhaps this may be where the higher quality kicks up to 1280×1024 HD – however my memory card is an SDHC 32GB and to record in XAVC S the camera reports on screen that this my card is not capable of using the higher quality recording mode. So an SDXC card is required for the higher spec video, and at with this standard (SDXC) you should be able to get 1920x1080p at 60FPS. I may go down this route – but for the moment – for my requirements – 720p is fine. Here are a couple of videos produced on the CX405 or HDR-CX405 by its full name! Ok – I will do some more, but that’s all for now due to the atrocious weather! The sound recording is also quite strong, I can clearly be heard on both the movies and the rain can be heard on the Christmas tree shoot. Connecting the CX405 To a PC/TV and also Charging the Battery. The cam has a very short USB cable attached to it which tucks neatly away into the hand grip. Provided in the kit is a USB extender cable (pictured below) which connects to this so that you aren’t trying to overstretch to reach the USB port on your PC. There is no USB port other than this on the unit. Once attached, the camera registered itself as a Hard Disk and I was able (under XP for this review) to navigate to the video files themselves using Windows Explorer. This is my personal preference, I do not like having to put up with proprietary software being installed on my machines – I have set ways of doing things which are perfectly fine for me, and I want to keep it that way until something really catches my eye and represents a useful step forward. I see little point personally in having a different video viewer for every gadget I own. 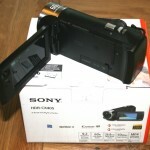 The Sony Handycam is therefore perfect as I gained access to the MP-4 files and was able to view and upload them to you tube with no fuss at all. The battery lasts around an hour, but this depends on how you are using the camera. I will be buying another battery (maybe two) as this is quite a short period of time if thinking of taking video when on a family day out. To charge the battery, we have two methods. Either the camera can be plugged into a mains charger (supplied) via the built in cable, or it can charge whilst connected in the same way (but typically via the extender) to a PC. Built onto the side of the camera beneath a protective flap is also a HDMI out port – this enables you to play back your videos on the full sized TV or on a computer screen. The Menu has a whole range of features such as all the usual quality settings, white balance, exposure, shutter speed, low lux, exposure, iris and focus. The great thing is – that for me – the whole range can simply be set to AUTO and off you go. For those amongst us who like to tamper and fiddle with things though – the options are certainly available. The flip out screen can be rotated to face completely forward for those all important selfie videos and photographs. The built in software on the camera also includes a video editor although I wouldn’t use it. The videos and photos can also be viewed on the LCD screen to make sure you have recorded what you were hoping for. So this review is not a user manual, it shows what the cam does and what you should expect. In summary – I am very pleased with my purchase and feel that it is money well spent and I am looking forward to making recordings on Christmas day. The CX405 Model From Sony. - I'm a bit unclear about FPS - but thats just me. - Focus could be a bit faster, you can see this on the video samples.